In the fall of 2008, when the Great Recession first reared its ugly head, it seemed the U.S. real estate market would never recover. Today, however, Realtors in the Philadelphia area happily report that the resuscitated market not only has a strong pulse but is also stretching its legs for a vigorous run. In the greater Philadelphia market, multiple bids are most frequently occurring on “properly listed and properly priced” homes in the range of $200,000 and $500,000, according to Mercer. Even so, he has begun to see this trend “filtering up” into homes with significantly higher price points. In addition to neighborhoods throughout the city proper, the Main Line has been a particularly strong area of growth. From January 2014 to January 2015, more than 1,775 homes on the Main Line—Easttown Township, Lower Merion Township, Narberth Borough, Radnor Township, Tredyffrin Township and Willistown Township, specifically—sold for an average of $654,638, according to TREND 2015 market statistics. The warmer months were the kindest to home sellers, so come springtime, when the brutally cold temperatures and winter precipitation have faded from memory, Mercer expects a full-fledged revival. Developers such as Odin Properties LLC and O’Neill Properties Group, for example, have had ample success transforming abandoned or underutilized sites into luxury living spaces. 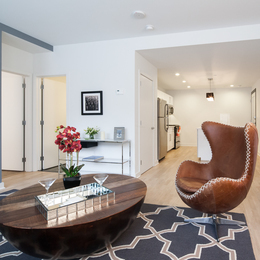 Odin Properties, which is based in the city’s Fishtown neighborhood, built its business out of a single nine-unit apartment building in 2009 and has since expanded to dozens of properties with more than 2,500 units throughout Philadelphia and its surrounding suburbs, as well as in South Jersey and the state of Delaware. O’Neill Properties, meanwhile, has rebuilt communities by establishing “islands of prosperity” along the Main Line—the Royal Worthington in Malvern, for example—out of properties that were once considered underdeveloped, maybe even eyesores. Also, more than ever before, so-called “empty nesters” and homeowners over the age of 55 are selling their familial estates and absconding to either upscale senior living communities or luxury apartment complexes such as The Palmer in Wynnewood or ICON in Center City (pictured). For prospective buyers of such newly available properties, Realtors suggest it’s all about positioning oneself as an attractive suitor. Although Realtors forecast steady growth for the short and long terms in nearly all sectors, rumblings of an increase in mortgage rates could put a damper on buyer demand. The average rate for a 30-year fixed-rate mortgage for most of 2014 oscillated between 4 percent and 4.5 percent, dipping to as low as 3.75 percent earlier this year. The Federal Home Loan Mortgage Corp., also known as Freddie Mac, predicts rates will inch up to 5 percent in late 2015. “In my career of nearly 30 years,” Mercer says, “I’ve seen rumors of mortgage-rate increases causing folks who are normally on the sidelines to get motivated and jump into the market so they can maximize what they can purchase, because you have more flexibility on a mortgage with a lower interest rate. If rates do go start to go up—and we’re already starting to hear it hyped in the news—it affects how much buyers can spend, and when that happens it affects everybody. When the building at 1616 Walnut Street in Philadelphia’s Rittenhouse Square neighborhood came to life in 1930, it quickly earned its stripes as an architectural marvel. The 25-story building received high honors at the 12th International Buildings Congress in Budapest, Hungary, and ultimately earned spots on the National Register of Historic Places and the Philadelphia Register of Historic Places. The esteemed Pew family once kept a pied-à-terre on the 25th floor. Living spaces come in a variety of configurations, from elegant studios (below 500 square feet) to residences with one (500 to 750 square feet), two (700 to 1,000 square feet) and three (1,100 to 1,400 square feet) bedrooms, according to Kevin Michals, principal with Cross Properties, one of the real estate investment and development firms responsible for breathing life into ICON. He’s not kidding. Currently 85 percent leased, ICON is expected to be fully leased by the end of April, according to sources close to project—30 percent faster and at a 20 percent premium over projections.